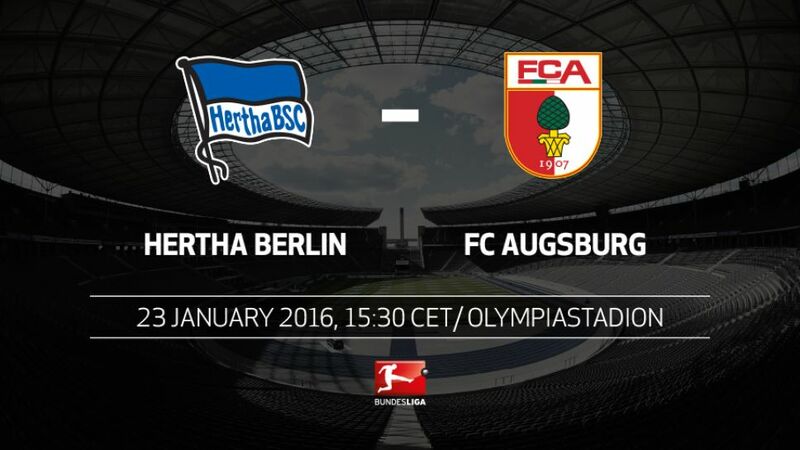 Hertha Berlin's unlikely push for a UEFA Champions League berth resumes this Saturday (kick-off 15.30CET/14.30GMT) when FC Augsburg are the visitors to the Olympiastadion. Pal Dardai's side were the surprise package of the Hinrunde, picking up 32 points to take third place, three points clear of fourth-placed Borussia Mönchengladbach and five ahead of the chasing pack. Salomon Kalou and Vedad Ibisevic have been leading their charge, with a solid defence giving them reason to believe their form can continue to the end of the season. Augsburg are not to be judged on their current league position, however. Juggling the Bundesliga with a maiden UEFA Europa League campaign initially proved hard for Markus Weinzierl's men, but they struck a fine balance towards the end of the Hinrunde and will be looking to forge a forward path in 2016. Hertha were the positive surprise of the first half of the season, but were the third-worst side in the second half of the 2014/15 campaign.Augsburg have picked up a collective 75 points in the first halves of their first four seasons in the Bundesliga, taking 97 in the second halves.Augsburg have not lost their first game in the new year in each of the past three seasons.Hertha, on the other hand, have lost their last three opening fixtures to the second half of the season.The home win in this fixture last term was Dardai's first as Hertha coach at the Olympiastadion.Hertha's forwards are the most clinical in the Bundesliga, needing fewer chances than any other side to score a goal.Conversely, Augsburg's attack is the weakest in the league, needing the most chances to score.Halil Altintop has faced Hertha 19 times, yet he is still waiting for his first goal against the Old Lady.Augsburg have won their last three away games in a row – a fourth would mean a new club record.